Home Film How The Disaster Artist Painstakingly Re-created Tommy Wiseau’s L.A. Though the story of Tommy Wiseau and Greg Sestero’s enduring, idiosyncratic friendship at the center of James Franco’s big screen adaptation of The Disaster Artist began in San Francisco, it no way negates the fact that Franco set out to tell an L.A. story; it has the Hollywood dream in its DNA. As reflected in the book on which the film is based–the eye-popping memoir of the behind the scenes madness that took place during the making of Wiseau’s riotous 2003 cult movie, The Room–Sestero paints a vivid portrait of the neighborhoods and streets he traversed with Wiseau, the Hollywood apartment buildings in which he resided, and the classic L.A. restaurants where he shared meals with the enigmatic director who would become his best friend. Tommy’s mysterious accent comes through during an audition scene, shot at Los Angeles Center Studios. When it came to realizing The Disaster Artist for the screen, production designer Chris L. Spellman, who has worked with Franco in various capacities since the short lived, fan-favorite television series Freaks and Geeks, says that Sestero’s knowledge was invaluable, especially when it came to the story’s locations. “He was essential in giving us information,” says Spellman. “When we asked specifically about a certain location he would give us as much information as he could recall about where it was and what it looked like.” However, Spellman says there was a conversation early on about how closely the filmmakers were going to follow the locations as they were written in the book. 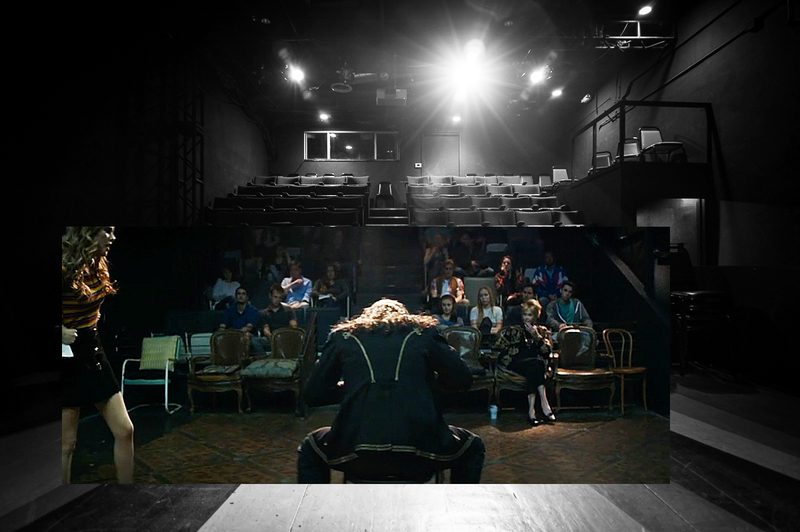 Ultimately, the filmmakers decided it was more important to follow the script, which took some liberties, but still included a number locations from the source material, some of which were re-created at other spots around town simply because the real places had changed in the fifteen years since Wiseau made The Room. Location manager Brian M. O’Neill says, candidly, “Trying to find an exact replica of a location is kind of a futile attempt, really. You’ve got to find the bones of it, and know Chris and his team can come in and tweak, paint, change, and replace.” The film encompasses locations all over Los Angeles, including a number of 1920s era buildings that convey the sense of old Hollywood the filmmakers were after. Spellman and O’Neill sat down with us to talk about how they re-created the L.A. of the late 1990s and early 2000s–for what is perhaps the most curious Hollywood story to come along in awhile. 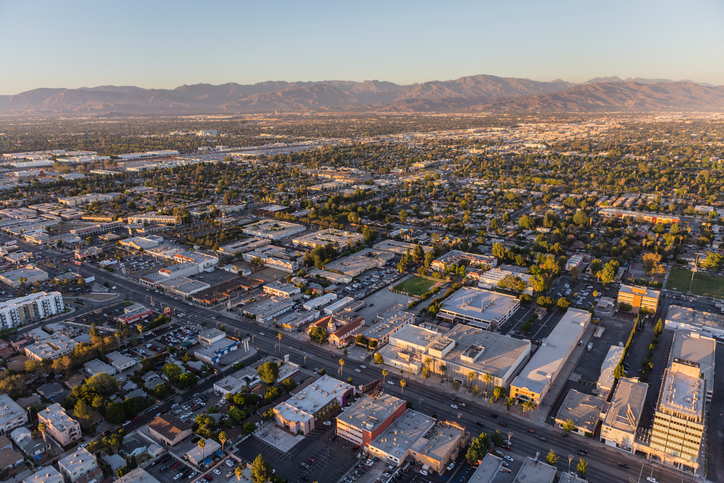 For a story set primarily in Hollywood, it may be surprising to learn that about half of the film’s twenty or so locations were found in the San Fernando Valley. The area around Lankershim Boulevard and Magnolia Boulevard became a central hub of shooting locations in The Disaster Artist. That was for a number of reasons, but the most important being that it hasn’t been filled with modern, luxury apartment buildings and every chain store imaginable. North Hollywood in 2015 and 2016 “was an area that was in the middle of a reinvention of its own self and it still kind of had the bones and felt in many, many [ways] that it was still the late ‘90s-early 2000s Hollywood,” O’Neill says. Theatre 68, where we see the introduction of Tommy Wiseau. From Tommy (James Franco) and Greg’s (Dave Franco) first meeting, to a Stanislavsky method acting class and, finally, Sestero’s appearance in Death of a Salesman, theaters would be a common thread tying everything together in The Disaster Artist’s NoHo hub. There are over a dozen theaters within a few blocks radius of Lankershim and Magnolia, and the filmmakers scouted many of them. “We went to theater after theater. We probably saw at least six or eight of them,” says Spellman. O’Neill also tells us that they even scouted Franco’s own acting school, Studio4, on Magnolia Boulevard, but it didn’t end up being used as a location. Three theaters in the NoHo Arts District were chosen for the film. Theatre 68 on Lankershim Boulevard is featured as a San Francisco acting school in the opening scene, in which Franco as Wiseau imitates Marlon Brando’s famous “Stella!” The 74-seat Secret Rose Theater on Magnolia Boulevard is seen in the film as the location of Wiseau’s Stanislavski class. 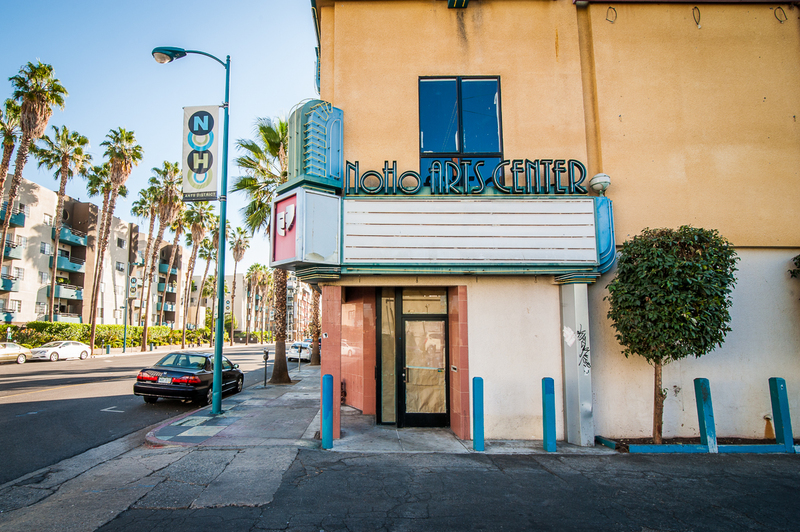 The currently-shuttered NoHo Arts Center shows up towards the end of the film, and is one of only a few specific locations that appear in both the book and the film. 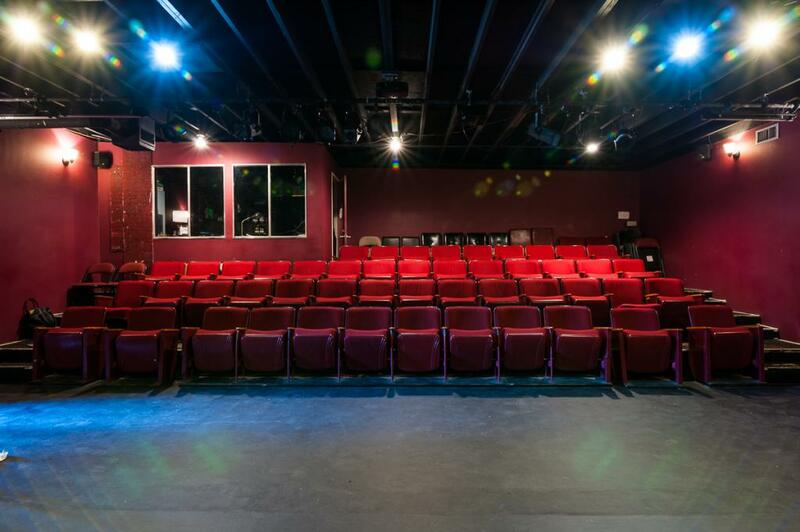 The NoHo Arts Center where Greg performs in Death of a Salesman. 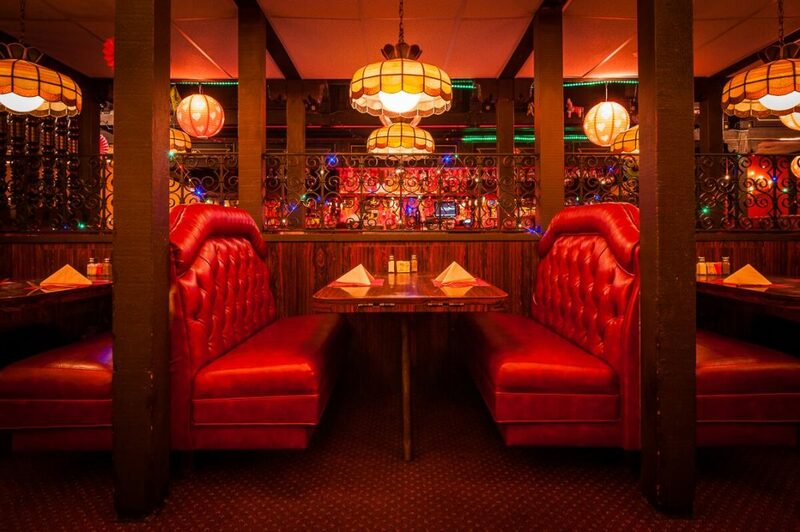 Ernie’s Taco House was interesting due in part to its classic red booths and twinkle lights that line the wrought iron divider. “We had a number of scenes of people eating, and nothing could be more boring if you don’t do that right,” O’Neill says. 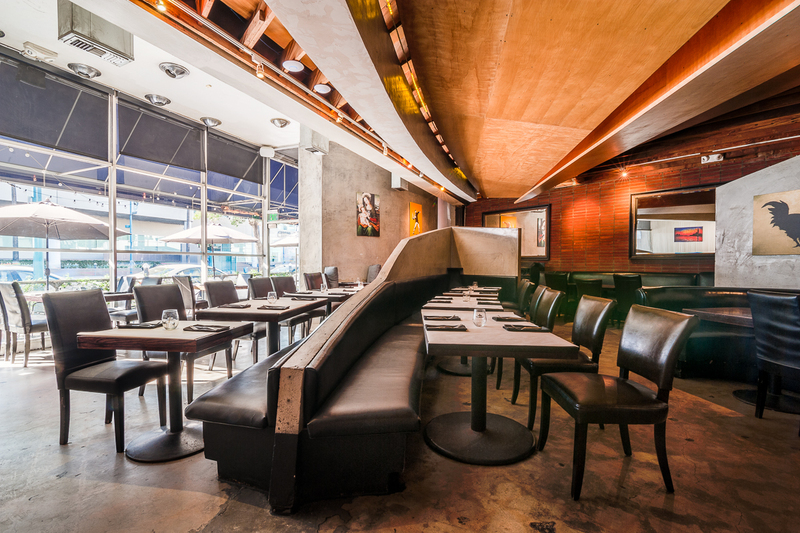 The solution to keeping those scenes engaging was to provide a wide range of restaurants. “We wanted to be clear that it was not all the same types of food,” says Spellman. He and O’Neill scouted just about every restaurant in the NoHo neighborhood where they had set up camp. Lighting trusses were installed above a back room at the Federal Bar in order for it to double as a Hollywood nightclub. In a twist of fate that added some L.A. authenticity, Poquito Más on Magnolia Boulevard took the place of a Baja Fresh, which, according to O’Neill, was written into the script, but the company wouldn’t cooperate with the production. Ernie’s Taco House, which opened in 1952 on Lankershim Boulevard, subbed for an Italian restaurant. The dining room of The Eclectic restaurant. There was one surprise at The Eclectic: “After we tech scouted, and I think the day we turned up [to shoot], the wall in there got painted purple. One of the walls that was clearly going to be seen. Chris and I looked at each other and I [say], ‘Well, got a bucket of paint?’” They put some plants in front of the wall to obscure it. “It was an unannounced alteration from the owner,” O’Neill says, laughing. 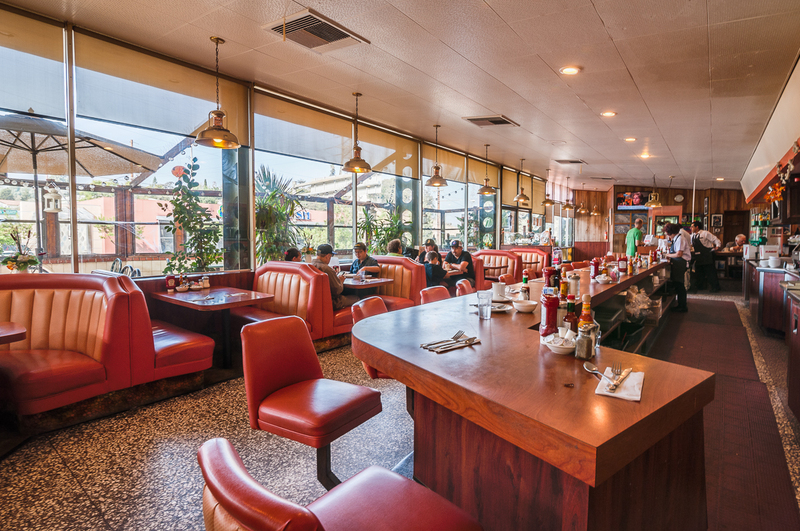 The L.A. pastrami institution shows up in the film a few times, including the pivotal moment when Tommy presents Greg with the finished screenplay for The Room and, in keeping with the time period, a scene at the bakery where Bryan Cranston, in a cameo appearance, offers Greg a small role on Malcolm in the Middle. The majority of The Room was filmed in a small studio space and parking lot at Hollywood camera house, Birns & Sawyer, once located at 1026 North Highland Avenue. From the sidewalk you can still grab a glimpse of the brick wall used in the film’s impromptu tuxedo-football tossing scene, but, since filming The Room, Birns & Sawyer has moved to North Hollywood. The filmmakers consulted with Birns & Sawyer on certain technical matters and obtained their permission to use the name and logo in the film, but the NoHo facility was not used as a location in The Disaster Artist, in spite of being right in the heart of the production’s Valley microcosm. After looking at various stages, including a basement space at Sunset Gower Studios, the filmmakers chose the Hollywood studios of Occidental Entertainment, only one block away from the Highland Avenue studio where Wiseau shot The Room. The location also provided the filmmakers with the all-important brick wall, the joke being that Tommy would build an alleyway set instead of using the real brick alleyway. Before Spellman began building his versions of sets from The Room, he had a conversation with the real Tommy Wiseau. He discovered that the director still had the walls from the original set, which was an exciting prospect for Spellman. “We could have taken the real walls for some of the sets–especially the downstairs or the upstairs where he shoots himself–and use the real walls in the making of our film about The Room… It was like, ‘oh, this is going way into meta-world’,” says Spellman. After meeting with Wiseau it became clear, however, that the original walls did not constitute a complete set. Without enough of the original walls available, Spellman painstakingly re-created The Room’s crimson living, bedroom, spiral staircase, and alleyway. The infamous green screen rooftop set was reproduced in Occidental’s parking lot, similar to how Wiseau’s green screen had been positioned in the Birns & Sawyer parking lot. “We just tried to replicate what they did,” says Spellman, matter-of-factly. “The craftsmanship was sometimes not level on certain things–we replicated that. The paint jobs were not exactly what I would do for a paint job on a certain film, but we replicated what they did… It was a mystery and we kind of just put the puzzle back together.” The result is a pitch-perfect resurrection of the tacky, bewildering sets from The Room. Additional scenes shot at Occidental Entertainment included Tommy’s extravagant headshot session, casting sessions for The Room, and a meeting in the Birns & Sawyer showroom. 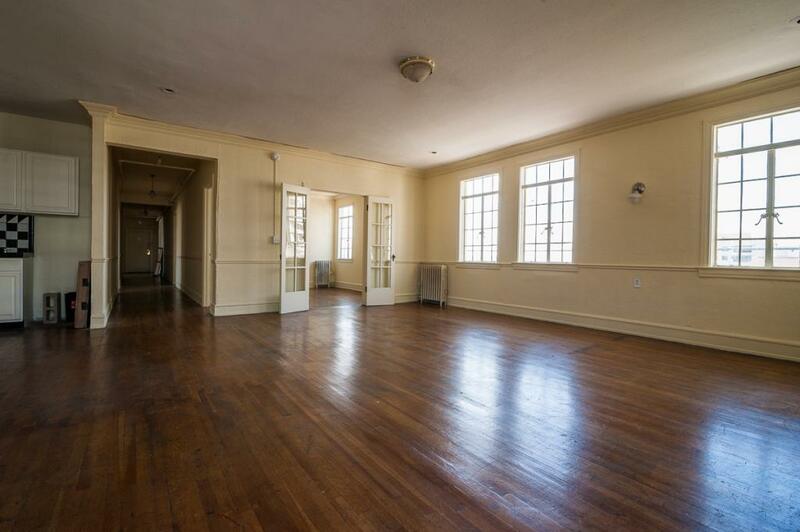 Things get a little tricky when it comes to the apartment buildings featured in The Disaster Artist. All in all, three buildings from the 1920s were chosen. One would double for the interior of Tommy’s San Francisco apartment and exterior of Greg’s L.A. apartment building. Another would become the interior of Tommy’s L.A. apartment as well as the exterior of Greg and his girlfriend Amber’s (Alison Brie) building, and the third would be used almost exclusively for establishing and rooftop shots of Tommy’s L.A. apartment building. After their raucous rehearsal in the San Francisco pizza place, Tommy invites Greg back to his apartment. It was essential to convey a sense of Greg being transported into Tommy’s mysterious world, which is why the filmmakers chose the Ardmore Apartments in Koreatown. “From the outside you don’t expect what you’re going to see when you step in that lobby,” says O’Neill. 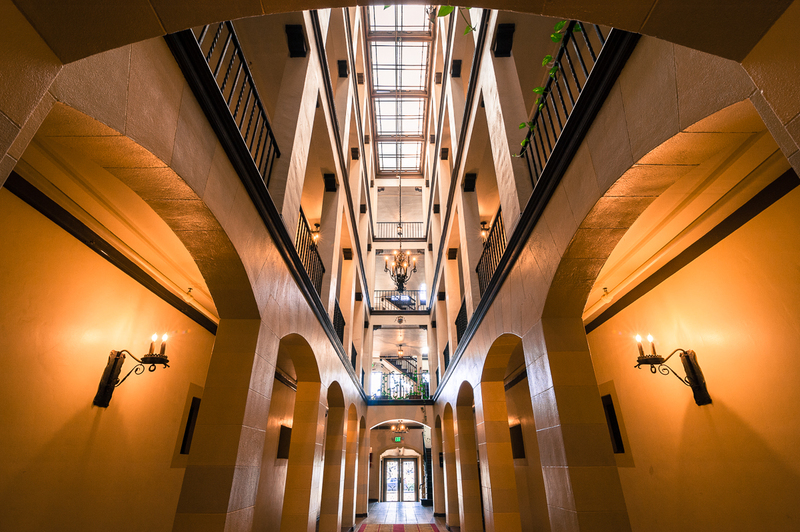 The building, built in 1926, boasts a four-floor atrium, wrought iron railings and wooden staircases. “The interior architecture of the lobby gave way to photos I saw of Tommy’s real place [in San Francisco],” adds Spellman. “That atrium–when you walk in there–it is Greg in a different world.” The Ardmore also worked as an exterior location in a quick scene when Tommy arrives in a limo at Greg’s place prior to the premiere of The Room. Less than a half-mile away from the Ardmore stand the Langham Apartments. Also built in 1926, legend has it Al Jolson had a hand in the creation of the Langham, which originally opened as a hotel and apartment building. 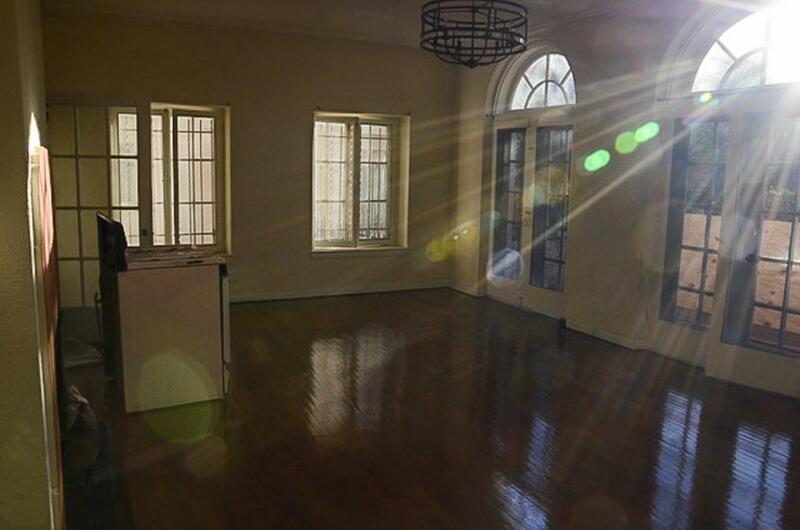 Here, inside the eighth floor penthouse that used to be home to movie stars like Ronald Reagan and Clark Gable before him, the filmmakers would create the interior of Tommy’s L.A. apartment. Spellman says that the floors, the moldings, and ceilings retained the feel of a classic Hollywood apartment. The layout of the Langham penthouse is comprised of various rooms branching off of one long hallway that leads to a living room and kitchenette. For Tommy’s apartment to work in the location, Spellman built a front door at the spot where Tommy and Greg approached the penthouse living room. This created the illusion that the living room of the penthouse was Tommy’s apartment and other tenants occupied the units off the main hallway. Additionally, the front exterior of the Langham and its pool were utilized, as was the southeast rooftop for a party scene and a Marvel-inspired add on at the end of the credits (so make sure you stick around). 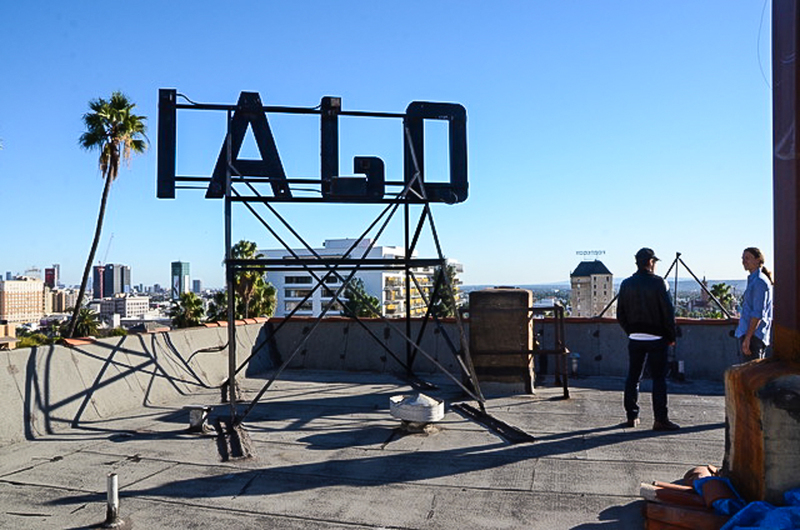 Scout photo of the roof of the Ojai apartment building. O’Neill first scouted the roof for Burlesque (2010), but it didn’t appear in the film. “That was one of the locations that James was pretty strongly opinionated on how do we make it work,” says O’Neill. “Logistically, that building is a complete headache” with a five floor walkup for the cast and crew and hardly any parking on the steep incline of Whitely Avenue. Those factors didn’t deter the filmmakers, and the extra effort put in at the Ojai paid off because the roof location features some of the most endearing scenes in The Disaster Artist. In one of just a few scenes in The Room that was shot at a practical location, Wiseau, as the film’s lead character, Johnny, walks into a San Francisco flower shop to purchase a dozen red roses for his girlfriend, Lisa. The storeowner doesn’t recognize Johnny when he orders the flowers, though it seems like Johnny is a regular customer. A moment later, in a bit of confusing dialogue, the shop owner says, “Oh, hi, Johnny. I didn’t know it was you.” Johnny receives his bouquet, pets a pug sitting on the counter, and exits the store. O’Neill tells us that the filmmakers flirted with the idea of shooting in the actual San Francisco flower shop in the Castro district that was used in the original film (where Wiseau paid just $20 to use it as a location) but it was no longer in operation. Spellman and O’Neill identified multiple flower stores in L.A. that could work, including a spot in trendy Larchmont Village, but they opted for a shop in their “plant the flag” area of North Hollywood. The Disaster Artist re-created the flower shop scene with extreme care at Josie’s Flowers. “That was the best to replicate the look and feel of the original one,” says Spellman. 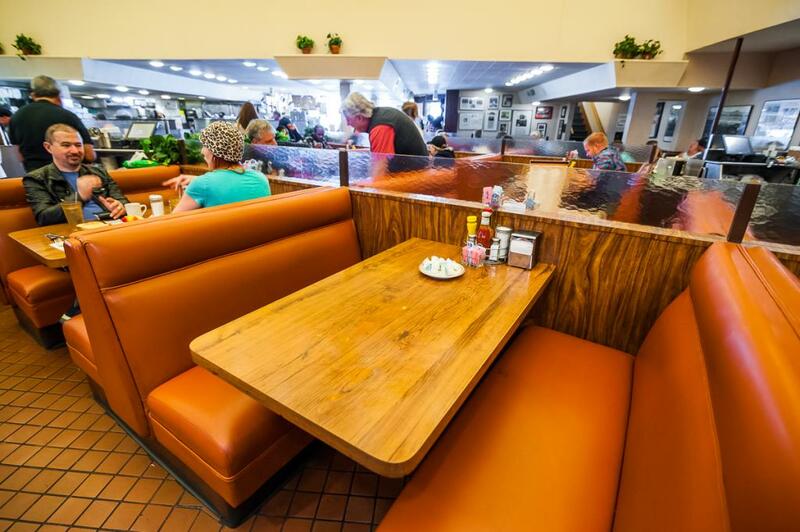 O’Neill says the location felt like the San Francisco flower shop because of its recessed door and glass windows. Spellman and his team used still photos of the flower shop scene and went left to right through the frame recreating as much as they possibly could. Everything from the flowers, greeting cards, some eye-catching gold pots and, of course, the pug, were all replicated in minute detail at the NoHo location. 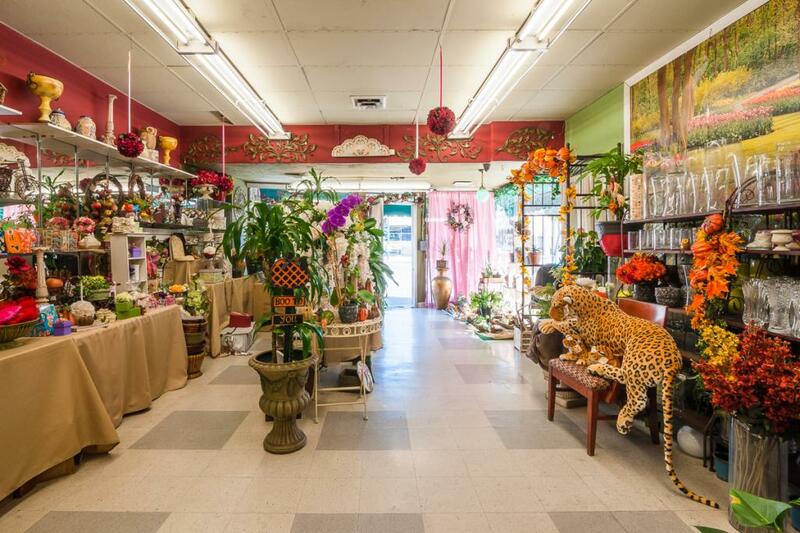 There was, however, one drastic difference in the configuration of Josie’s Flowers: it had much more depth between the front door and the sales counter than that of the original San Francisco location. Franco’s character would not have been able to enter the store and reach the counter in the same amount of time that Wiseau does. To remedy this situation, Spellman cut the store’s depth in half by building a counter in the middle of the showroom floor. Of all the unbelievable–but true–stories about The Room, perhaps none is more legendary than the bizarre billboard at the busy intersection of Highland Avenue and Fountain Avenue that advertised the film for five straight years. Wiseau erected the ad in the heart of Hollywood and included on it a close-up, black and white image of his face that resembled a mug shot, a website address, and the phone number to an RSVP hotline. It should come as no surprise that the filmmakers of The Disaster Artist used this very same billboard location for their recreation of the fabled advertisement. Spellman says they discussed printing an actual billboard-size poster for The Room, this time with Franco as Tommy. “We actually tracked down the company that rents the billboard out. We could have gotten it for the time period that we needed to film it,” says Spellman, but ultimately, the filmmakers decided to add the poster digitally in post. Sestero grew up in the San Francisco suburbs, so the filmmakers didn’t want the neighborhood where Tommy arrives to pick Greg up to feel too L.A. “We did some research and saw what Greg’s house [looked like],” O’Neill says. “He gave us photos and then we Google Earth’d what it looks like now. 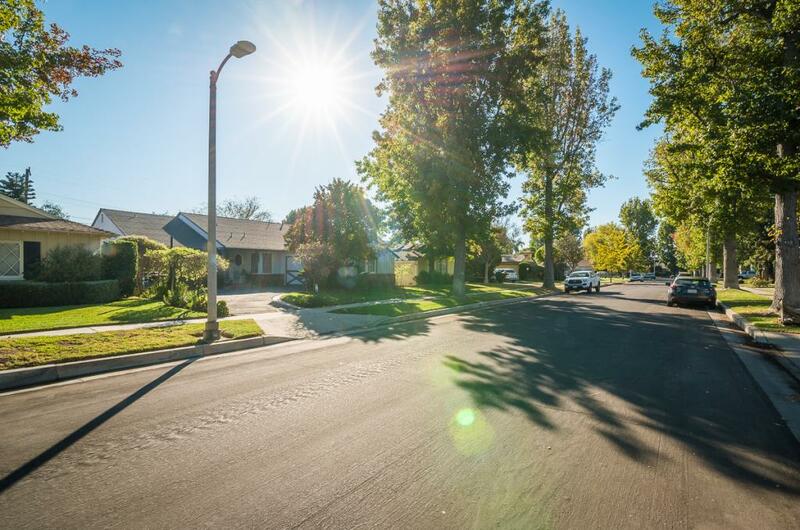 So I start there, at the socioeconomic class that we’re looking for.” O’Neill adds that they didn’t want to go too far off the beaten path from the film’s NoHo locations, so they chose a nondescript, single family home in Valley Village, just off Burbank Boulevard. Though most of Wiseau’s film was shot in Los Angeles, the overzealous filmmaker did take a skeleton crew to San Francisco, where he shot few exterior and practical locations at the end of the production schedule. Taking a cue from the source material, Franco almost shuttled The Disaster Artist‘s crew to San Francisco to follow in the footsteps of Wiseau, but weather conditions and costs ultimately made it prohibitive to travel up north during the film’s 35-day shoot in December 2015 and January 2016. In the book, Wiseau and Sestero hung out playing soccer and football at the Polo Fields in Golden Gate Park, for which the filmmakers of The Disaster Artist needed to find a suitable double. O’Neill says, “We looked at Griffith Park, but Golden Gate Park is so specific. You’re not going to find a ‘cheat’ so to speak. You kind of just need to find the best you can.” North Hollywood Park, where Greg is seen jogging in The Disaster Artist, was also an obvious consideration due to the proximity of other locations. 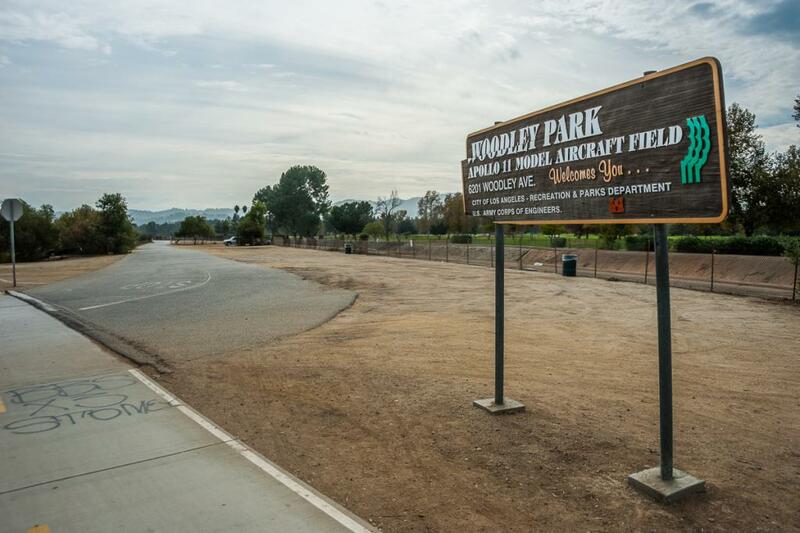 The most felicitous spot they found, however, was the spacious Wright Cricket Field at Woodley Park in Van Nuys. Making the location even more appealing was the fact that the filmmakers could duplicate one of the most meticulously re-created sets in the film across the street from the cricket fields. There was talk of shooting at the James Dean crash site for a scene in which Wiseau and Sestero, big fans of the Rebel Without a Cause actor, make an impromptu drive from San Francisco to the junction near Cholame, CA where Dean was tragically killed in 1955 driving his Porsche 550 Spyder. Opposite the cricket fields on the other side of Woodley Avenue, however, was a stretch of road leading to the Apollo 11 Model Aircraft Field where Spellman could replicate the site. “James was very interested in exactly how [Dean’s] car crashed, where it came from, where the memorial is,” says Spellman. “So we did our research, we did some plans, we drew it out, we had photos from the crash site. 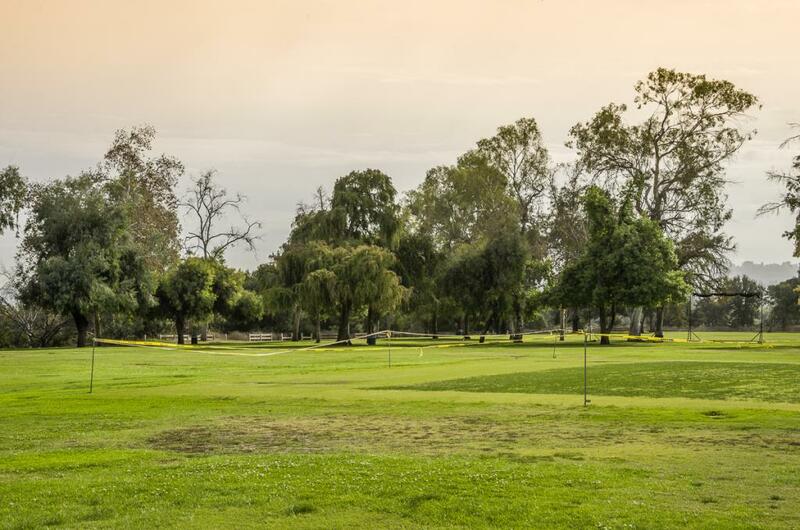 We put up signage, replicated the ‘Do Not Enter’ signs, built a barbwire fence in an area so we could film it and get our intersection.” The adjacent Woodley Lakes Golf Course was never visible as the scene was shot at night. The Woodley Park location of the James Dean crash site is in a low-lying drainage basin. O’Neill says that the day after filming at the crash site it poured heavily, which would have submerged the spot under water making it unusable for the next month. “We happened to get a little bit lucky there,” he says. Tommy Wiseau’s The Room premiered on Friday, June 27, 2003 at the single screen Fairfax Laemmle Theatre on Beverly Blvd. Members of the cast and crew were present as were a multitude of strangers hired by Wiseau’s PR representative in order to fill the seats. Opening in 1930, the Art Deco Fairfax Theatre, which would change ownership a number of times over the next seventy years, permanently shuttered in 2010. Without the possibility of using the actual theater where The Room premiered, O’Neill explored other single screen theaters around town. The 1926 El Portal Theatre back in NoHo was seriously considered. O’Neill says that, while the El Portal would have worked, “the interior of that theater has become more of a [live] performance theater” rather than a dedicated cinema palace. With its neon-lit marquee, there was discussion of breaking up the movie premiere scene, using the exterior of the El Portal and the interior of another theater, but, in the end, a scheduling conflict forced the filmmakers to explore other options entirely. 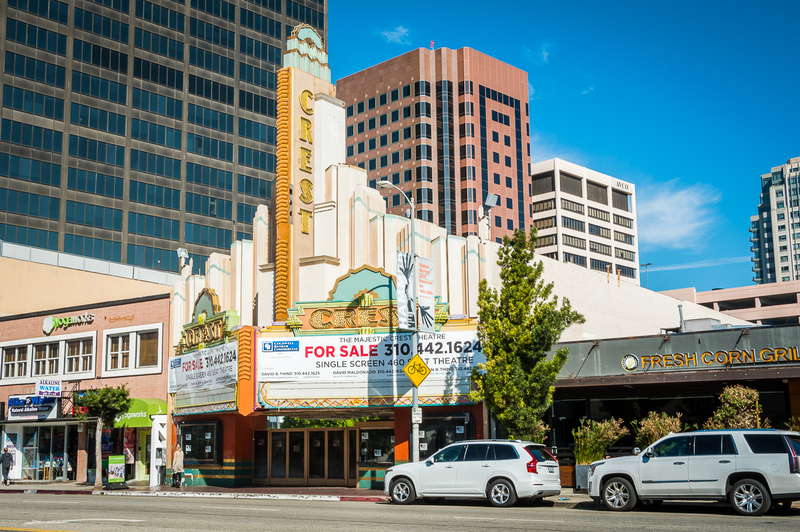 Eventually, the filmmakers decided upon the colorful Crest Theatre in Westwood. In December of 2015 the theater was almost exclusively screening live-streamed ballet and opera performances and other limited engagements. Even with the theater chosen, it still proved to be a demanding task to accommodate the requirements of the scene. “We needed to do the limo pulling up and going around the corner and there are movie theaters right there that were all premiering Star Wars,” O’Neill says. “So it was a busy Thursday and Friday night in Westwood the week before Christmas.” Parking in Westwood also became an issue for the few hundred background actors needed to fill the seats. “We had to carpool from the Beverly Hilton and shuttle them all the way back,” adds O’Neill. As if Star Wars wasn’t enough of a snag, ten to fifteen rows of the Crest’s seats had been removed and replaced with a stage for live performances. “So we had to find theater seats and bring them in,” Spellman says. Please keep in mind that some of these locations are on private property. Do not trespass or disturb the owners. Next articleCan You Guess Which Jeff Koons Balloon Animal Is Being Built at LACMA as We Speak?